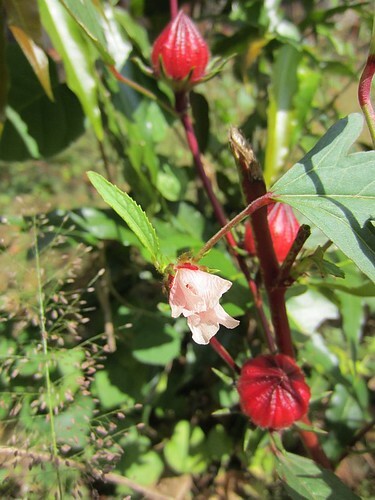 This issue of #LEARNABOUT is the second part of a two-part series featuring the roselle plant. In this issue, we will learn about the fruit/calyx. You can find the first issue, talking about the leaves, here. 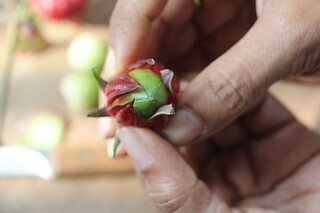 Before we begin, we have to throw a special thank you to our wonderful friend Deepa at Pâticheri, for letting us use the images and the knowledge from her original article "That which we call a Roselle." To understand what a calyx is, we have to first talk about sepals. A sepal is a part of a flower, usually green, that surrounds and supports the petals of the flower. A flower usually has 3-5 sepals, and collectively, the sepals are called the calyx (plural calyces). In most species of plants, the calyces usually fall off after fruiting, but that's not always the case. In some species of plants, the calyces remain on the fruits, and aside from roselle, the eggplant family Solanaceae also are filled with fruits whose calyces will remain after fruiting. Both eggplants and tomatoes belong to the Solanaceae family, and we will talk about many other fruits in the Solanaceae family in the future issues of #LEARNABOUT. So next time when you pop off the green calyces when you wash your tomatoes, I hope that you can be reminded of roselles. 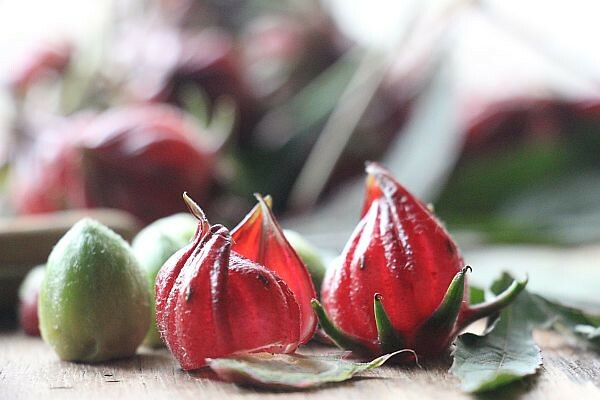 There could be major confusion to what you call a roselle fruit. 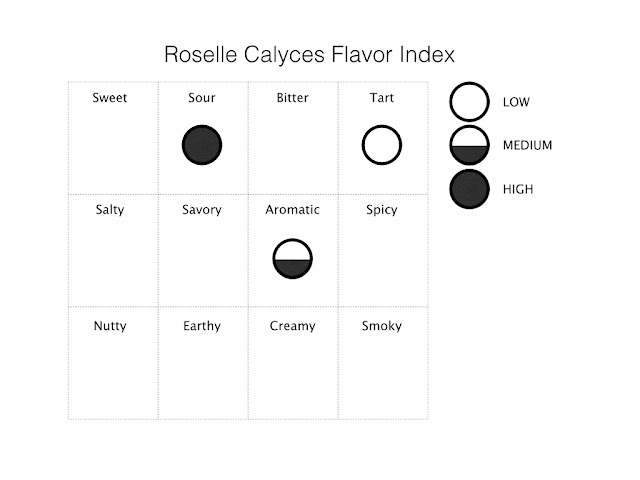 What most people call a roselle fruit is actually a roselle fruit + a roselle calyx. The green olive-looking thing in the center is technically the biological fruit, which we don't eat. The pink-looking thing is the calyx, which is what we are talking about here. To confuse you even more, some people also would call the pink calyx of the roselle plant a "roselle fruit," and they aren't 100% wrong either. A roselle calyx can be classified as an accessory fruit (or false fruit, pseudofruit), in which some of the flesh is derived not from the ovary but from some adjacent tissue exterior to the carpel. "...neither mulberries nor blackberries are typical fruits. Blackberries are what botanists call an aggregate fruit, which develops from the merger of several ovaries that were separate in a single flower. Other examples include strawberries and raspberries. Mulberries are what botanists call a multiple fruit (or compound fruit), which develops not from one single flower but from a cluster of flowers. Other examples include pineapple, jackfruit, and guava." 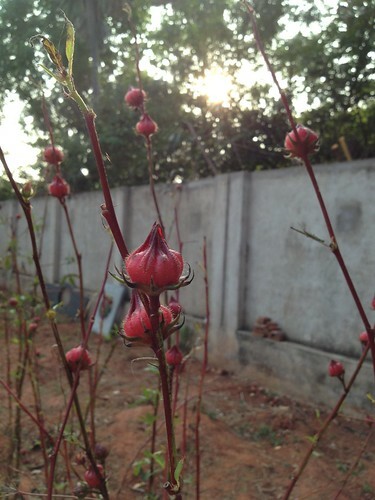 What makes roselle calyces special? Roselle calyces contain high levels of flavonoids, which has shown antioxidative activity, free-radical scavenging capacity, coronary heart disease prevention, anticancer activity, even anti-HIV functions in various researches (Here's a scientific review article). Flavonoids are also by a large part what gave tea and wine their healthy acclaims. Upon those benefits mentioned above, in India, Africa, Eastern Asia and Latin America, infusions of the leaves or calyces are regarded as diuretic, cholerectic, febrifugal and hypotensive, decreasing the viscosity of the blood and stimulating intestinal peristalsis. 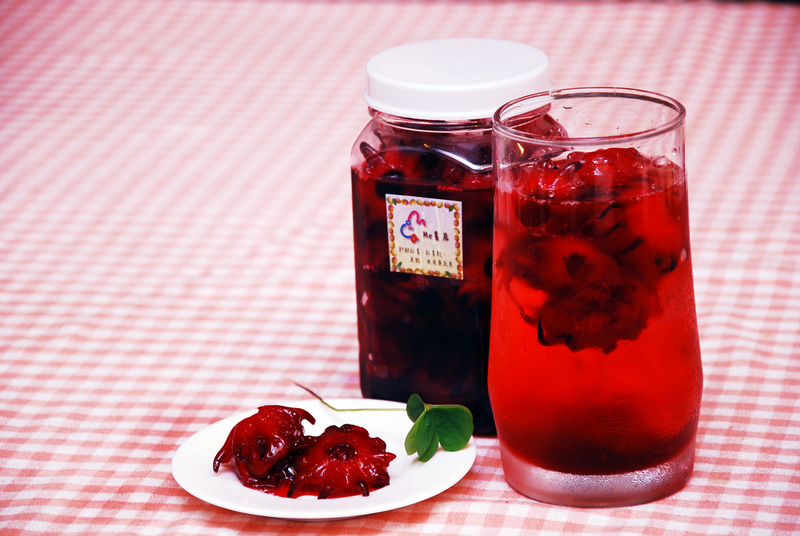 Therefore, the most common use for roselle calyces is infusion in tea, in which the dried calyces are commonly used. Where can I find roselle calyces? You might have learned from our previous issue that the roselle plant likes warmer climates. In fact, the plant won't even fruit if the temperature fall below 10 °C (50 °F). Therefore, you are more likely to find the fresh calyces in the southern states in the US, or in tropical parts of the world. However, the dried calyces could be easily accessible in any tea market/Asian market. They might be under the Chinese name "Luo Shen Hua Cha (洛神花茶)". 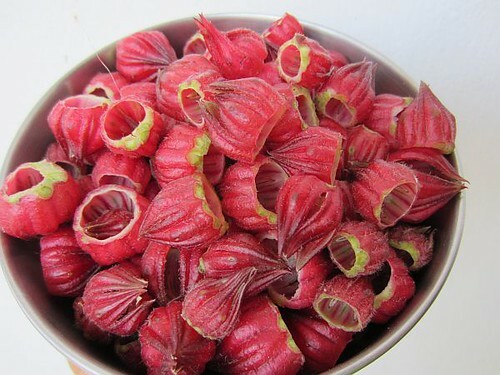 If you are one of the lucky ones to find fresh roselle calyces in a local market, make sure to make some jam out of them! 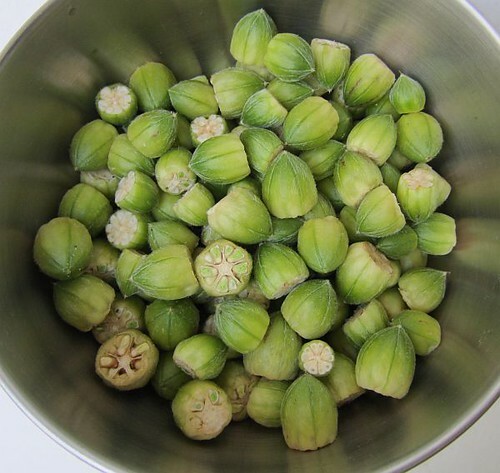 Our friend Deepa's article is a wonderful guide to make roselle jam. If you decide to make tea out of dried roselle calyces, you can simply soak the dried calyces in hot water, and watch the water turn into a vibrant red/ruby-colored goodness! There is even a Chinese myth about how the color is from the tears and blood of an ancient goddess. If you are in a Latin American restaurant and see "agua de Flor de Jamaica," "agua de Jamaica," or "rosa de Jamaica," (or commonly referred to as hibiscus tea), this is made with roselle calyces! Make sure to try some. Because the calyces themselves have only a tart/sour cranberry-like flavor, make sure to add some honey/sugar to your roselle tea, or mix the tea with other fruits. Generally, you don't want to eat the green olive-looking roselle fruit (pictured above), because they are hairy and rather unfriendly to touch and feel. However, they dry relatively quickly and burst open to release seeds, which makes cultivation super easy. It's not recommended to eat the fresh calyces raw either, with the same reason why you might not want to eat a raw cranberry. Thanks Xueqiao~ I will add that to the text.